Back-Up Story: "The Origin of The Joker"
The Challengers from Beyond are on Earth-3 fighting the Crime Society. On Earth-3, the heroes are villains and the villains are heroes. Bob teleports away. The entirety of the Crime Society is about to pounce on the Challengers when Earth-3 "hero" the Jokester rushes in. Back on New Earth, Holly sends Selina Kyle (Catwoman) a letter explaining that Athena is sending her on a secret pilgrimage to Paradise Island. As she leaves, one of Athena's people rips up the letter. In Zrrf (a.k.a., the Fifth Dimension), Mr. Mxyzptlk is walking his goldfish Superman with his girlfriend Gsptlsnz when he's suddenly ripped right out of the Fifth Dimension. In Turkey, Eclipso smooth talks Mary Marvel. Mary is skeptical and untrusting so Eclipso leaves. Mary's approached by guards and she uses magic to turn them to stone. Eclipso returns and asks Mary how it felt to do that to the guards. Mary says it felt good. Eclipso tells Mary to come with her, that she'll help her analyze her new abilities and reach her final destination. In the 'burbs, Karate Kid and Una seek out Buddy Blank and ask him to take them to see Brother Eye. Jimmy's being examined by the team at the Cadmus Project who are using an Ambient Nuclear Ultra Spectrograph. The machine appears to make Jimmy's powers all kick in at once. Back on Earth-3, Ultra Man and Superwoman are about to pull Jason Todd apart when he's rescued by Kyle Rayner. Donna is thrown into the two of them. Bob the Monitor teleports into the action and tells them Ray Palmer isn't here so Bob teleports them all out of Earth-3. The Jokester teleports out with them. Ultra Man wants to know who they're going to kill now. The Monarch appears and offers them the chance for victory in this and every other known universe. In the multiversal nexus, the Monitors are troubled by the Jokester now joining the Challengers in their universe-hopping. One Monitor contends that Bob must be stopped at all costs. The Joker may or may not have once been a costumed crook called the Red Hood, or a failed comic, or a gangster named Jack Napier. I wonder what Christopher Nolan (director of 2008's "The Dark Knight") would say about all that. Main Story - 1: Poorly-written, totally unworthy nonsensical trash. Note to Owlman: you shouldn't know who Batman is when Jason refers to you being a second-rate version of him. Note to Holly: you ran away from Selina Kyle and all your other friends to protect them so why would you write her a letter and then mail it by placing it in the "mail out" box at the main desk of the Athenian Women's Shelter where anyone can - and does - interfere with its dispatch? By the by, this totally contradicts current events in the ongoing "Catwoman" title - Holly should not be able to contact Selina as Batman just helped her fake her own death. Note to Mary Marvel: there is no redemption for your character now that you've killed people. Nice knowing you. Note to Karate Kid and Una: honestly, who cares? Note to Cadmus: the proposed acronym for your machine speaks volumes for "Countdown". Main Art - 2: Jimmy Olsen, fat (stretchy) b@st@rd. Back-up Story - 2: What a waste - the Joker's origin is currently being recapped in an interminably unending "Batman Confidential" storyline. And here Waid's telling us that the Joker has no origin we can rely on - well at least I made the right decision dropping "Batman Confidential" two issues back. Back-up Art - 4: Bolland on the Joker. The killing joke is on the fans that this gorgeous two-page spread is in this otherwise horrendous book. 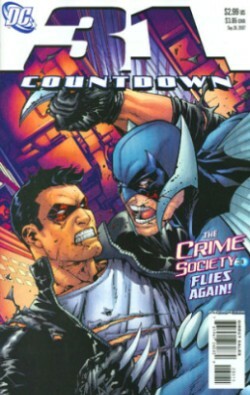 Cover Art - 2: There's a new Crime Syndicate/Society and you waste half a cover on Jason Todd? Check out the cover to "Countdown to Adventure #2", also released this week - that's the type of cover this book should have had. When did Jason Todd get Wolverine claws anyway? Superboy-Prime, please punch the walls of limbo and release us from this misery already.